re-classified myself as a small-ship enthusiast. 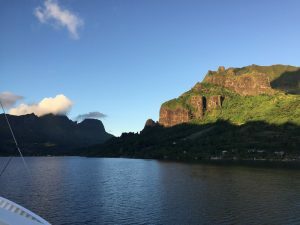 We set sail from Tahiti's capital, Papeete, which IS a bit "touristy", but woke up the next morning in Cook's Bay on the island of Moorea; we watched the sun rise over Magical Mountain. After breakfast we took a launch to the shore where we boarded a small speed boat and headed off for a day of spinner dolphin-viewing and snorkeling (lots of rays and small sharks amidst a myriad of other brightly colored fish and coral in crystal clear waters). Happily tired at the end of the day we motored back to our ship for a delicious dinner and some delightful wine that not only quenched our thirst but ensured an early night. 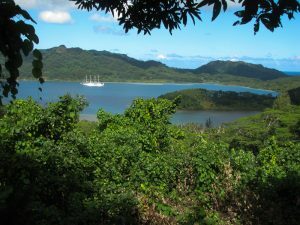 The next morning found us moored off the "sacred island" of Raiatea. 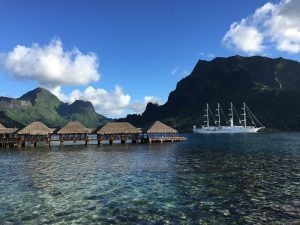 Once the center of religion and culture in the Society Islands we chose to visit the UNESCO World Heritage site of Marae Taputapuatea, the center of the "Polynesian Triangle" where the world of the living intersected with the worlds of ancestors and gods. 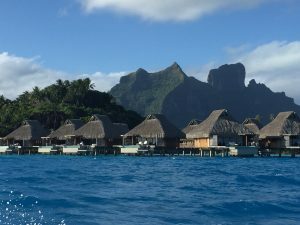 Bora Bora and Huahine. 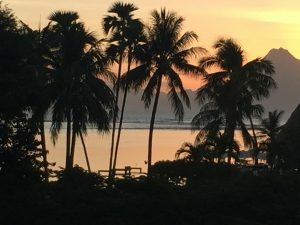 Each day began early and was filled with exploring, hiking, swimming, snorkeling, kayaking (even some R&R) and ended with great food, wine, socializing, and entertainment. 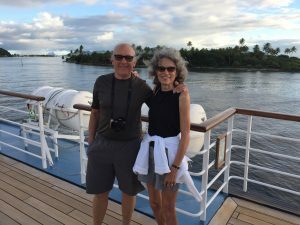 Apart from vanilla and coconut plantations, tourism is THE livelihood of Polynesia, but the islands are anything but crowded. 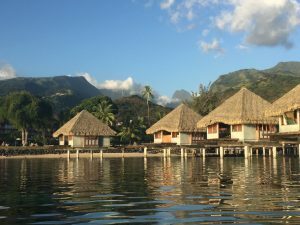 Over-the-water bungalows can be found on most islands, but there are NO highrises. French Polynesia covers a total area of 2.5 million square km, with a land mass of of 3500 square km and population of 280,000. And we didn't run into a single unhappy, unpleasant "local". I can only imagine that this must have been what Hawaii was like 100 years ago. If only it could stay this way forever.